Being in solitude is consciously choosing to be alone for a period of time. In solitude we connect deeply to ourselves in order to connect with others. Solitary communion with ourselves prepares us to relate with others. In solitude we learn what we think, how we feel, what we need, what we are good at, what we can offer, what we want, what we wish for, what we dream, what we like, what we fear, what we love. In solitude we understand ourselves, we become self-aware. Solitude is not the same as being lonely. 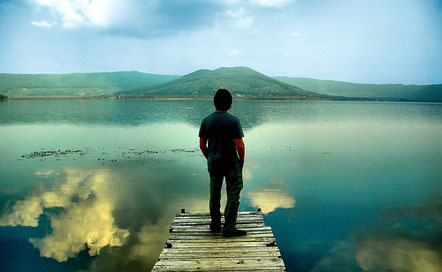 In solitude we choose to be alone and we find God's companionship and friendship. We learn that we are never alone. In these quiet moments we rest our ego, we listen and we hear. In solitude we reconnect, find guidance and clarity and strengthen our soul. As we practice solitude we find comfort in it, we seek it, we go to it and we enjoy it. We nurture ourselves in solitude. Today is a good day to spend a few moments in solitude...to be quiet and so recharge our spirits and receive the answers we are looking for.